Liam and I have started to try eating a vegetarian dinner once a week or so, partly to experiment with some new ingredients, and partly to save on calories and help towards our health kick. I'm a huge fan of big bold flavours, and have often been disappointed with vegetarian foods which are usually lacking in that department. Determined to prove that vegetarian food can be exciting I wanted to share this recipe with you which I saw cheeky chappie Jamie Oliver make on ITV's This Morning a few weeks ago! I scribbled down some notes as he was cooking and soon decided to give it a go myself. 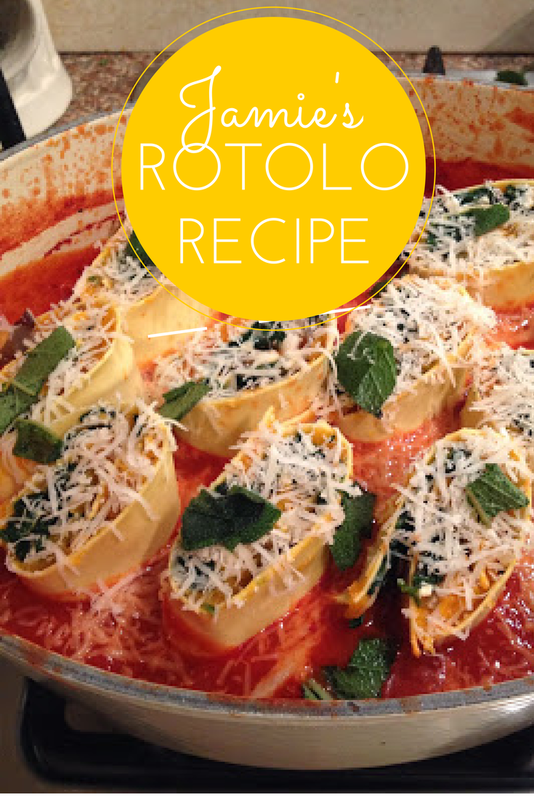 I'd never heard of it before, but Rotolo is basically a pretty cannelloni ... baked and stuffed pasta sheets in a tomato sauce. Jamie's recipe suggests baking the pasta rolls in a quite plain herby tomato sauce - I however beg to differ and suggest invigorating your sauce with chilli flakes, sweet paprika and hot smoked paprika for LOADS of extra pizazz! Cook the squash whole on a roasting tray for around 1 hour 30 minutes, then remove from the oven. Meanwhile, peel and roughly chop the onion, put it into a medium pan on a medium-low heat with a lug of oil, the thyme and a pinch of salt and pepper, and cook for 10 minutes, stirring occasionally. Stir in the frozen spinach, cover with a lid and allow to slowly cook for another 15 minutes, or until the liquid has evaporated, then remove from the heat. 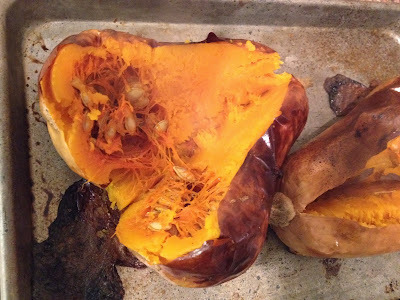 Cut the squash in half, discard the seeds and skin, then mash up with a fork. 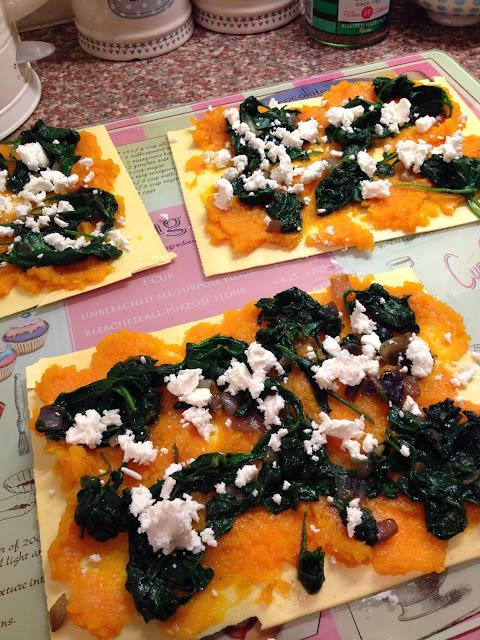 Keeping them separate, season both the squash and spinach to perfection with salt, pepper and a grating of nutmeg. Peel and finely slice the garlic, then put it into a shallow 28cm casserole pan on a medium heat with a splash of oil and fry for a couple of minutes, or until lightly golden. Pour in the passata, then add a splash of water to the empty jar, swirl it around and pour it into the pan. Bring to the boil, simmer for just 3 minutes, then season with the spices and herbs to your personal taste. On a clean work surface, lay out the pasta sheets facing lengthways away from you. Working quickly so your pasta doesn't dry out, brush them with water, then evenly divide and spread the squash over the sheets. 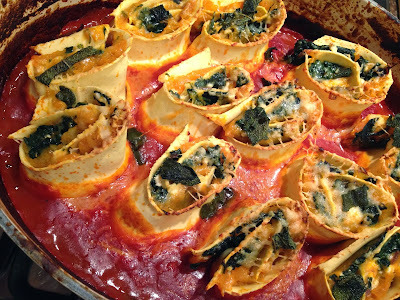 Sprinkle over the cooked spinach and crumble over the feta. Roll up the sheets and cut each one into 4 chunks, then place side by side in the tomato sauce. 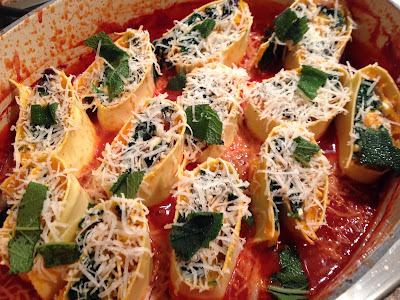 Finely grate over the Parmesan, then pick the sage leaves (if using), toss in a little oil and scatter over the top. Bake for 35 to 40 minutes at the bottom of the oven until golden and crisp. We served ours with a few slices of garlic bread. 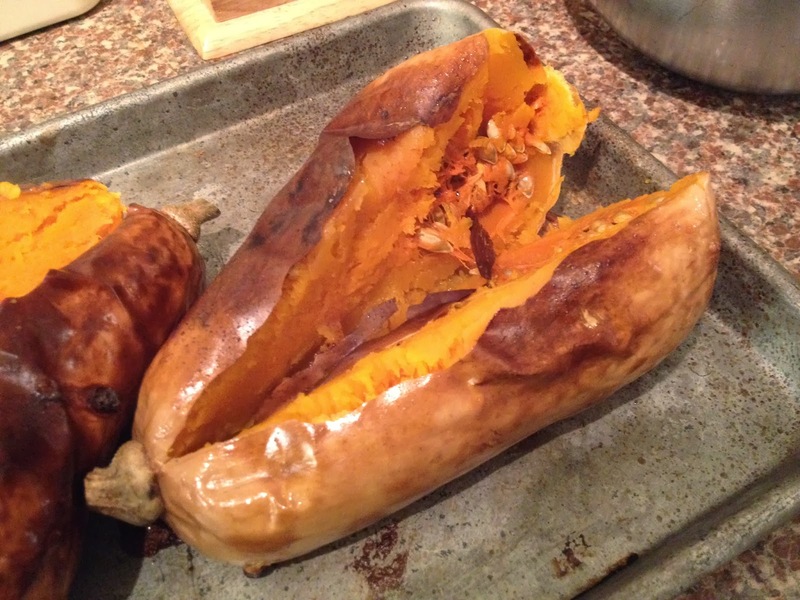 a very delicious veggie recipe! you really don't miss the meat..! Do you ever eat veggie? What are your favourite vegetarian ingredients? 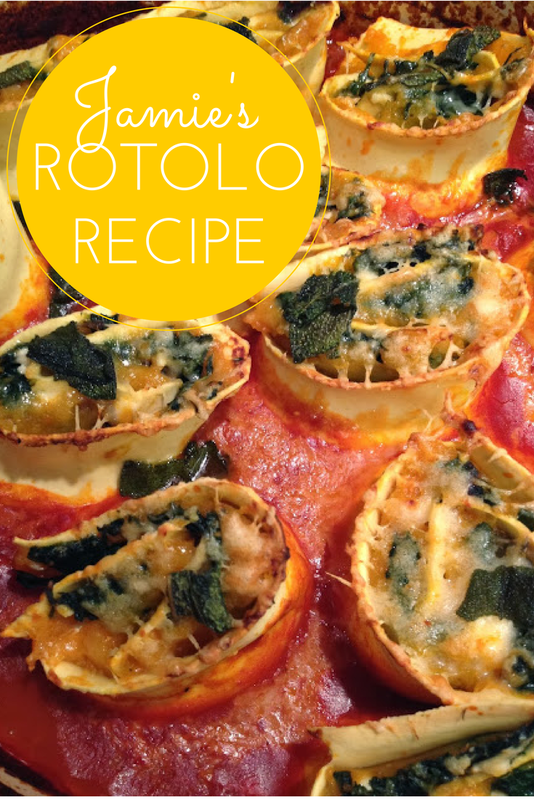 Bye for now and happy Italian cooking - why don't you give this a try?